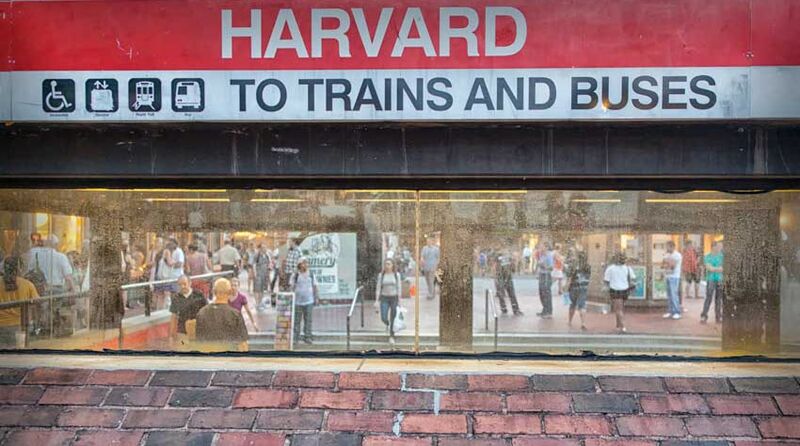 Harvard Square is only a short “T” or Uber ride across the Charles River from The Lenox Hotel – whether you’d like to visit for a few hours or make a full day of it. When I think of Harvard Square, the first thing that comes to mind is all the famous people that have walked down these cobbled streets from presidents to actors to CEO’s of some the largest companies in the world. It is also adjacent to Harvard University and is Cambridge’s oldest neighborhood. I love finding a place to sit with a cup of coffee to people watch. Then take in some of the eclectic boutiques, sidewalk cafes, bookstores, and the amazing restaurants. Below are a few of my favorite spots to visit! I suggest starting your day at the center of the Square. 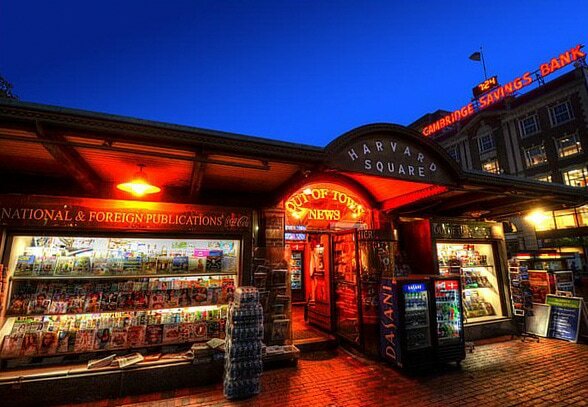 It is where the oldest Harvard Square Subway stands & Out of Town News, where you will come across an extensive collection of newspapers & magazines from around the world. It is also where the “Hahvahd Tour” starts which I highly recommend – it runs about 70 minutes long and the distance is less than a mile. The tour is scripted although the guides are very entertaining and it is the best way to learn about Harvard’s rich history & culture. 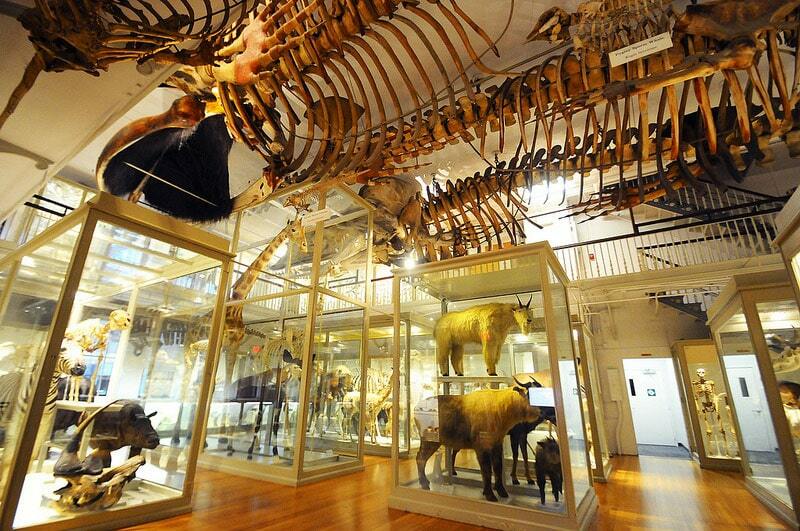 If you have time head over to the Harvard Museum of Natural History, it’s about a 10-minute walk from the square. In the Museum’s permanent galleries, you’ll encounter the diversity of life on earth, from dinosaurs to fossil invertebrate and reptiles, to large mammals, birds and fish, and the only mounted Kronosaurus. Also, you’ll come across the internationally acclaimed Ware Collection of Blaschka Glass Models of Plants, the “Glass Flowers.” This unique collection of over 4,000 models represents more than 830 plant species. After the tour, continue down Mass. Ave. where you’ll come upon Harvard Book Store. 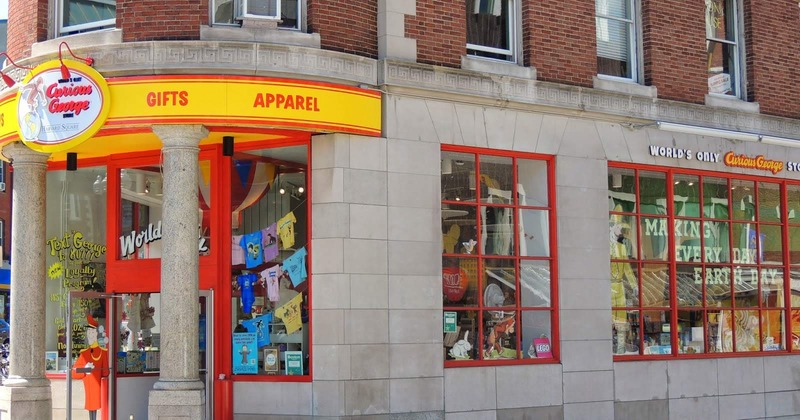 Established in 1932 as a place for Harvard students to buy used textbooks, it has transformed into a place known for its extraordinary selection of new, used and remaindered books. It’s easy to get lost here, browsing the rows and shelves for a diverse range of books. This is the must-visit for any true book lover. Definitely walk along Cambridge’s original thoroughfares like Brattle Street (known as Tory Row) and Winthrop Street, which date back to the 1600’s. Some of my favorite shops are along Brattle St. are Cardullo’s Gourmet Shop, it’s a specialty food store on Brattle Street where you will find freshly prepared foods, possibly be able to sample as well from around the world. And The World’s Only Curious George Shop is always fun to walk through even for the young at heart. You’ll want to check out one of the many restaurants that Harvard Square has to offer. Next to The Harvard bookstore is one of my favorite burger places, Mr. Bartley’s Gourmet Burger Cottage. Voted ‘best burgers in America’ according to the Boston Globe and the Wall Street Journal, Mr. Bartley’s is a local favorite where each visit is an experience. The walls are covered in Boston and Cambridge-related posters and picture frames. The atmosphere is loud and vibrant. 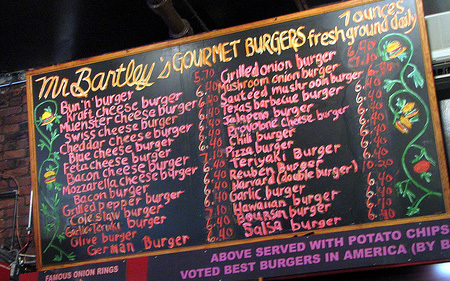 The best thing about Mr. Bartley’s is its rotation of creative and ever-changing names for specialty burgers. 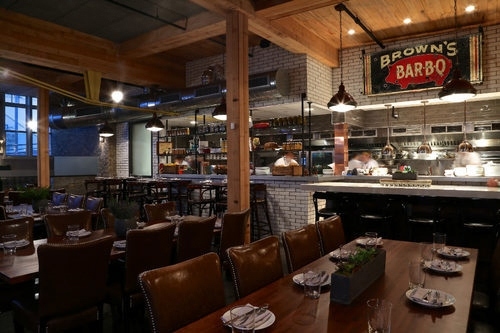 Another one of my favorite restaurants is Alden & Harlow, located in Brattle Square. It’s inventive & seasonal new American fare and was recently nominated for The James Beard Award & also named Best Restaurant this year by Boston Magazine. Before heading back into Boston, I recommend stopping by Harvard Coop for souvenirs.